Factory Direct Discounts from Artograph! Put a whole new spin on drawing, tracing, designing or animating with the New LightPad Revolution™ light box. A new tool for artists, designers and animators. This unique revolving light box provides artists the option of conveniently rotating their project for more comfortable and accurate tracing or designing. The rotating disc can also be locked in place with the included exclusive Disk-Brake™ – securing any project from unwanted movement for detailed drawing or lettering. A 5⁰ indexed disk guide around the disk allows for precise measurement. This entry was posted in Light Boxes, LightPad Revolution and tagged LED light box, light box, LightPad, LightPad Revolution, LightPad Revolution 120, LightPad Revolution 170, LightPad Revolution 80 on April 5, 2014 by Artograph. 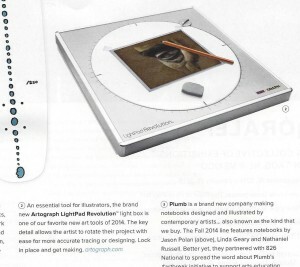 The October issue of Juxtapoz Magazine magazine is out with an AWESOME review of the LightPad Revolution by Artograph! "An essential tool for illustrators, the brand new Artograph LightPad Revolution light box is one of our favorite new art tools of 2014. The key detail allows the artist to rotate their project with ease for more accurate tracing or designing. Lock in place and get making." The man who deserves to be known as the father of American animation is Winsor McCay, whose creation Gertie the Dinosaur was the very first dinosaur to be on the big screen. McCay was one of those enormously important innovators who create whole new art forms. As important as Walt Disney and Chuck Jones are in the history of animation as the ultimate masters of the form, McCay was the man who brought together many of the technical innovations that animators still use today, as well as being the first to create characters with whom audiences fell in love.